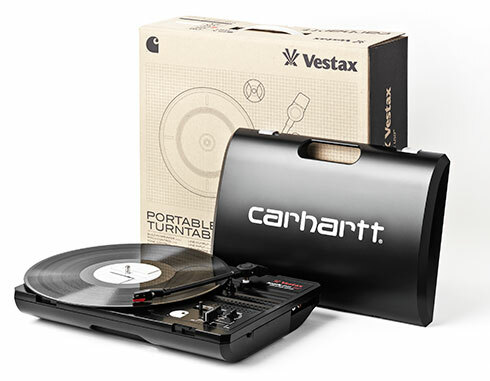 For the Fall/Winter Collection 2009 Carhartt is cooperating exclusively with Japanese company Vestax to bring a limited edition of the Handy Trax USB turntable into the shops – a portable record player for all-round use. This vinyl player is the perfect pulse generator for picnics that turn into cosy open-air parties. It is also the perfect listening device for every dyed-in-the-wool vinyl enthusiast during extensive excavation trips at fl ea markets and record shops. A tough plastic casing and the capability to operate at angles of up to 90 degrees make the Handy Trax player fit for universal use. On top of this, a stereo line-out makes hooking it up to your hi-fi system at home easy and a mini line-in jack also allows you to connect external devices such as MP3 players. That’s why Carhartt recommends using your Vestax Handy Trax USB turntable for nothing else but vinyl. • Battery operation (6 x AC12V) or mains operation (external power adaptor included). • Stereo line-out (mini jack) for connection to hi-fi systems (Aux in), DJ mixers, etc. • Works at angles of up to almost 90 degrees!